Global Soundproof Curtains Market size was valued at over USD 1.60 billion in 2017 and will witness gains at over 7% from 2018 to 2024. 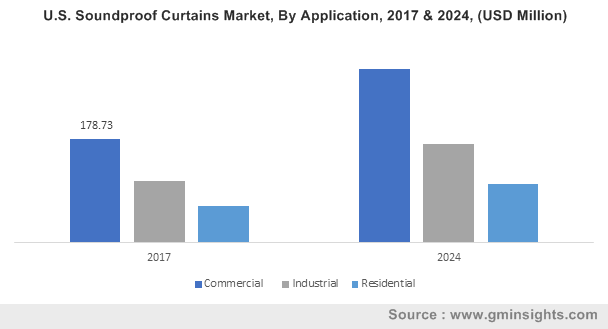 Increasing construction activities coupled with rapid advancements in acoustic insulation material technology are expected to propel soundproof curtains market size. Upsurge in smart city projects with public and private financing will fuel product penetration over the forecast timeline. In addition, increasing necessity to reduce noise pollution level will augment demand for the acoustic environment, thus supporting the product demand. Rapid expansion in commercial sector including hospitals, airports, shopping malls and movie theatres will boost the industry size. Increasing construction of new healthcare facilities across Asia Pacific region owing to the rise in geriatric population will augment the product demand. In 2016, European health sector accounted for 15% of public expenditure and 10% of GDP. International organizations and regulatory bodies including WHO and The National Institute for Occupational Safety and Health (NIOSH) are encouraging the usage of soundproofing materials to minimize the long-term noise pollution effects. Increasing demand for noise-free environment in elderly care premises across hospitals will further provide strong business outlook for manufacturers. Increasing demand for insulating materials with high R-value including fibreglass along with ongoing technological development are anticipated to support industry expansion. Manufacturers are forming long term supply contracts with raw material suppliers to reduce operational cost and gain competitive advantage. Rising demand for acoustic panels and other soundproof products are likely to hamper the industry growth over the forecast timeframe. Stringent government norms and volatility in raw material prices may pose challenge for manufacturers. Increasing concern regarding plastic usage and disposability may restrain the market. Glass wool accounted for over 50% industry share by volume in 2017. Key aspects such as durability, ease of installation, cost and lightweight are expected to drive soundproof curtains market demand. Wide adoption for glass wool insulation across commercial sector owing to better acoustic properties compared to counterparts is anticipated to propel product adoption rate. In addition, better handling and safety features are likely to support product demand over the projected timeframe. Plastic foam material will witness CAGR over 6.5% from 2018 to 2024. Factors such as durability, inertness, and water resistance are fuelling the product sales. Enhanced demand for sound screen installation around loud equipment such as vacuums, pumps, compressors and generator across industrial sector will augment the product sales. Increasing necessity to control the noise in quarry, industrial plant, high-voltage equipment areas and other factories will drive the soundproof curtains industry share from 2018 to 2024. Sound-blocking segment is expected to surpass 300 million square meters by 2024. Product property such as mass or weight is the key factor for their noise reduction. Increasing growth in automotive sector including European countries such as Italy, France, Poland which in turn drive the industry growth. For instance, France has witnessed its vehicle registrations growth of 1.75% in 2017. Rising necessity for sound blocking products will augment the soundproof curtains market growth. Sound-insulating will witness growth at 6.5% from 2018 to 2024. Developed countries including Sweden, Belgium, Portugal etc are observing construction sector growth over the forecast timeline. For instance, stabilization in residential sector growth in Sweden has driven its total construction output by 4.5% in 2016. In addition, Swedish government has announced plans for providing financial support and development plans for 250,000 residential buildings by 2020. Commercial soundproof curtains market size was valued at over USD 850 million in 2017. Increasing commercial spaces construction such as restaurants, health care facilities, office complexes will drive the product demand. Emerging countries including China, Netherlands, South Africa etc have shown positive trends in the commercial sector expansion. 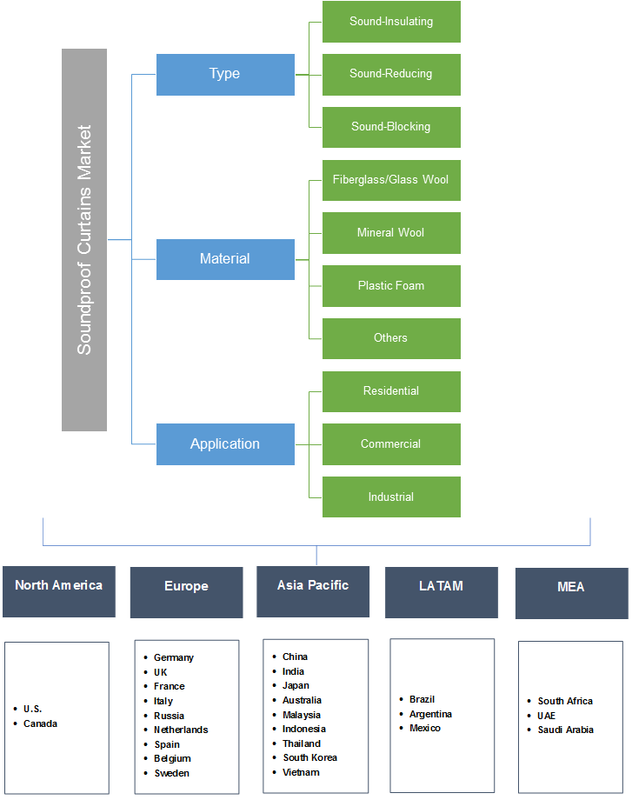 Industrial soundproof curtains are anticipated to observe CAGR at over 6.5% from 2018 to 2024. Newly constructed building standards in Asia Pacific will support the industrial demand. The segment will attain maximum noise absorbing performance with the usage of mass loaded PVC and vinyl coated fabrics. Fast energy savings, economical than the firm walls, easy in customizing & movement and effective noise control will have a positive impact on the industry expansion. Europe soundproof curtains market accounted for over 50% share by revenue in 2017. Travel and tourism sector expansion in European region particularly in Germany, UK, France and Italy will propel the market growth. The government’s stringent norms regarding sound pollution and rising end-use industries such as residential, commercial and industrial are some factors stimulating the industrial growth. Asia Pacific soundproof curtains industry will witness growth at over 8% from 2018 to 2024. Increasing population along with high disposable incomes are among the key factors contributing to industry demand. Availability of land and low-cost labour across the region will support the construction growth in residential and commercial sectors. Global soundproof curtains market share is fragmented due to presence of established and local manufacturers. Acoustical Surfaces Inc., GLT Products, Quiet Curtains, HOFA, and Flexshield are among the key industry players. Other participants include Acoustic Curtains, Moondream, Steel Guard Safety Corp., Kinetics Noise Control Inc., Envirotech Systems Pvt and Sound Seal. Manufacturers are adopting several growth and expansion strategies including mergers & acquisitions, product portfolio expansion and collaborations to enhance their industry share. Soundproof curtain is a flexible mass loaded vinyl (PVC) that helps in the resisting the sound waves passage and decreases the airborne noise transmission. It is used in the form of an acoustical panel that is free hanging usually with the loop fasteners and grommets. They can be hung, rolled up, or flat laid for off-season storage. It is resistant to the adverse environmental conditions and suitable for various outdoor applications. Shifting consumer preference for competitive priced and visually attractive products has enhanced the soundproof curtains demand. Abundant products availability with varying designs, purposes and colours along with the customizable solutions and products offered will boost industry growth. Soundproof market is witnessing substantial growth owing to the rise in number of health issues among people due to noise pollution.